Dr David Grimes: Is Obesity Bad for You ? Is Obesity Bad for You ? The generally held view is that we are witnessing an epidemic of obesity which will lead to countless deaths from diabetes and heart disease. This is one of many health warnings that we hear, all of which deliver dire warnings of impending doom. Slimness is all-important. The overweight are made to feel guilty. It is claimed that the obese are or shortly will be the majority of the population. Obesity is usually measured by the BMI (Body Mass Index) which is body weight adjusted for height. A tall person could have the same weight as a short person but would have a smaller BMI, and would need to have a greater weight before being labelled as overweight or obese. A person of height 1.8m is said to be underweight if less than 60kg, normal if 60-80kg, overweight if 80-100kg, and obese if greater than 100kg. The weakness of BMI is that it does not just indicate the fat content of the body but also its protein content and so it is not a reliable indicator of obesity. The definitions of normal and obese have been redefined to make more people “obese”. The forecast epidemic of obesity is not happening and the proportion of the population said to be obese has not changed during the past ten years. It is about 35 per cent at present. However the prevalence is not distributed evenly across society. Obesity in the UK is much more common in the poor, the socio-economically disadvantaged, than in the wealthy, and this is especially true in women. The reason is not known but it is somehow linked to other diseases. It is not clear whether it is behavioural, the result of faulty eating or lack of exercise. It could be biological, perhaps linked to the bacteria living within the intestine, which are related to and possibly causative of obesity. It could be something to do with low levels of vitamin D reflecting lower exposure to the sun. 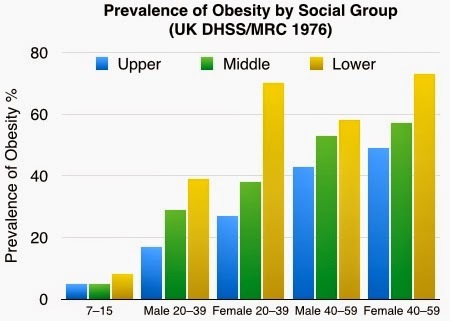 We can see in this UK study from 1976 (Department of Health and the Medical Research Council) that in all groups obesity was more common in the "lower social groups", what we call today the rather cumbersome "socio-economically disadvantaged". It is said that the obese will die from heart disease and heart failure. However this has not been the experience during the past twenty years. The survival of people with heart failure is surprisingly better in the obese than in the thin. This has been demonstrated in Sweden, in people following a heart attack. In the USA it has been shown that the long-term survival of normal-weight people with type 2 diabetes was only half of that of overweight or obese people with type 2 diabetes. It is the very underweight who have the worst survival but this appears only in older people. Young people have such a low death rate that differences will not be apparent. 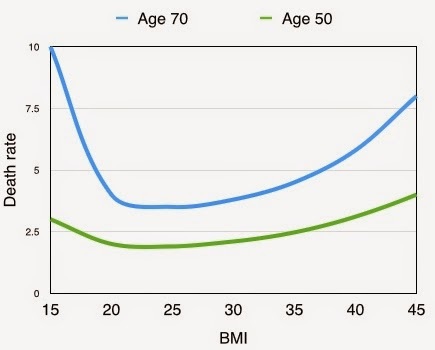 Figure 3 shows that the relationship between death rate and BMI is what is called a “U-shaped” curve. This is quite common in health-related biological measurements, for example death rates and alcohol consumption. It means that extremes are not good and it is best to be in the middle, in this case normal weight or overweight. Being grossly overweight is bad, but normal weight people should not strive to be thin. There is also a difference between the “healthy obese” and the “unhealthy obese”, and judged by cardiovascular parameters such as blood pressure and insulin resistance. Strict adherence to BMI does not seem to be sensible.